Every time I think of global warming, I think of our old neighbour, John. John and his very lovely wife lived next door to us at the Treehouse in Sydney. On the day our furniture was being picked up, two days before our 10-month road trip began, John and I had a very interesting conversation about global warming on the front lawn. Despite the fact his granddaughter is getting her PhD on this very subject, John thinks global warming is a ‘bunch of crap’. He went on for a while, trying to convince me ‘all this weather stuff is cyclical. It’s just the way things go’. He had no facts to back up his arguments, saying global warming was ‘just another thing for the greenies to get upset about’. The ironic thing about this is John is an avid yachtsman. You’d think that he’d be a believer… He’s even been to the Great Barrier Reef but I guess you’d have to go below the surface to see the reef damage. Everything always looks lovely and rosy from the surface. It just goes to show that there are some who aren’t aware, or simply don’t care, about environmental impact. Fortunately, there are those will do whatever they can to protect it. We were reluctant to snorkel on the reef. In fact, after our initial research, we seriously considered not doing it. When we arrived in Cairns, I saw tankers and cruise ships, I found myself red-hot mad. “Why are they here? Why are they anywhere NEAR the reef? !” I was seething. We all know it’s more complicated than that. 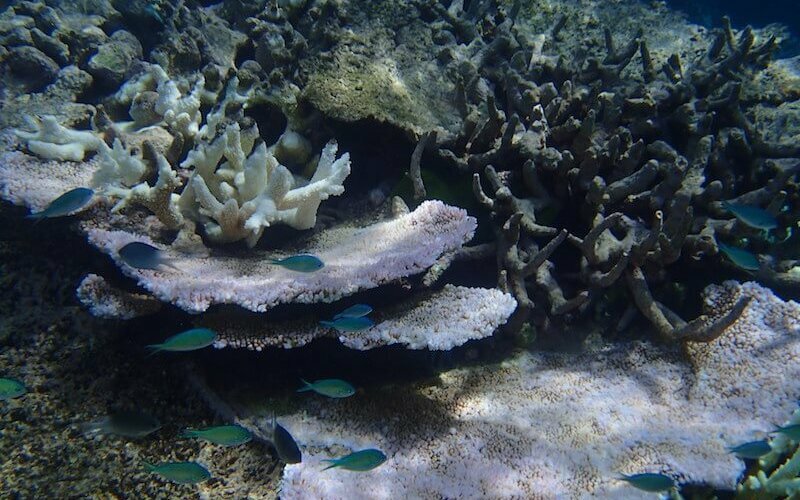 Bleaching on the Barrier Reef is a major concern. Most seem to be aware (except of course, John) of how the human impact on the environment is affecting the reef. Sadly, it’s happening at a very fast rate. We asked ourselves: What makes us any different, being travellers, heading to Cairns to explore the area? 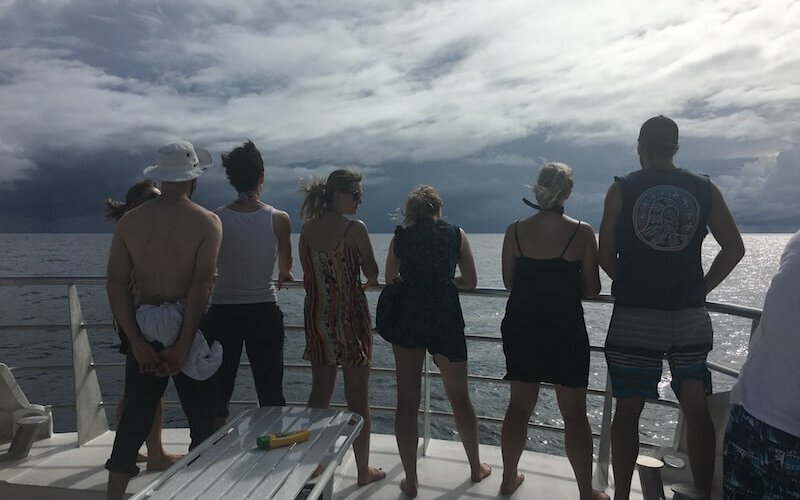 We wanted to see the reef but did it make sense to go out there to see it? Just being there, as visitors, were we really any better than the cruise-goers? I know that not all cruise-goers fit this description. In fact, I know many who love length ocean cruises. But I also know a number who do fit that mould: They want convenience at any cost. Sadly, there are plenty of snorkel companies who will accommodate that crowd for quick cash. No, we aren’t like that. We care. 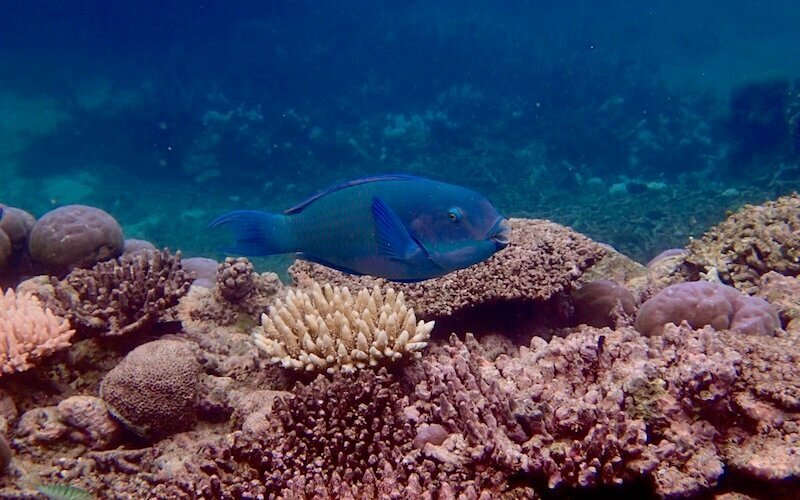 We want to do what’s right by the reef–Even if that meant giving up something on our Living List. When we researched our snorkelling adventure, we were very particular about which company we wanted to go with. They HAD to be eco-friendly, involved in Reef research and use a boat that was the least impactful to the area as possible. We had very high expectations. We decided that unless a company had all those requirements, we would simply not snorkel the reef. We wanted to make sure even our miniscule jaunt didn’t contribute to the larger issue. We’re aware enough – and have snorkelled enough – to know how impactful humans are to the environment. We found a company – Wavelength – who met all our requirements. The outfit is family owned and run. They keep their tours small. They employ a team of marine biologists for every trip to the Outer Reef. It was an amazing experience seeing the living reef and the abundance of marine life on the outer reef. The experience was made even better to learn about the fragile ecosystem directly from experts. 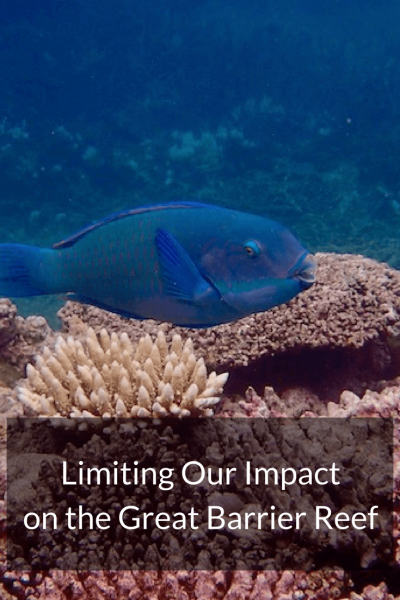 Rising ocean temperatures is affecting the Reef primarily. Even though it’s only a few degrees higher, it’s causing the coral to die. 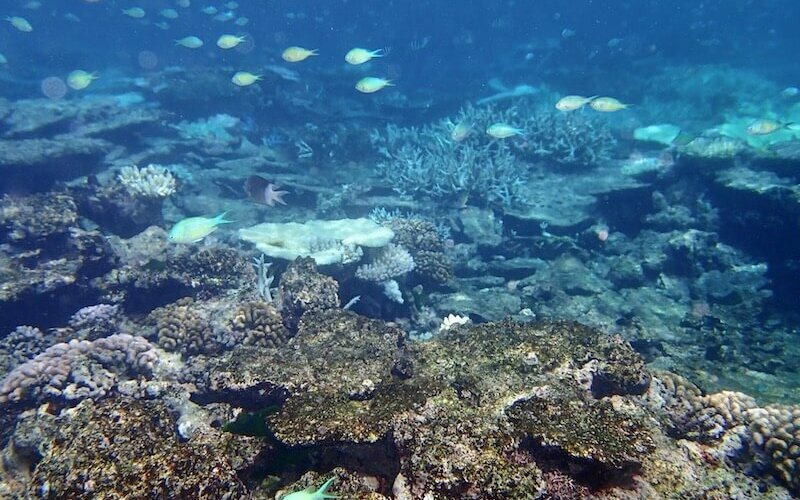 The part of the reef we visited was in the beginning of a bleaching event we were told by our guide. Add in other environmental impacts, like plastics, oil spills, etc…the rate of decline is alarming. On our second time in the water to snorkel, we learned about different parts of the coral. 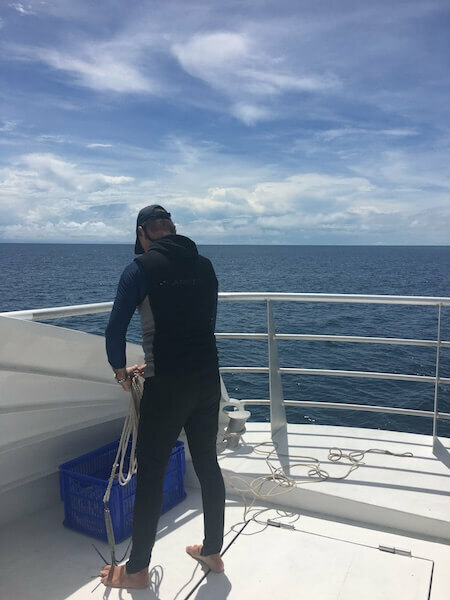 We embarked on a roving, 30-minute snorkel as a marine biologist provided greater detail about what we were seeing. During lunchtime, another marine biologist gave a talk about the impact global warming is having on the reef. My favourite fact about this company: they don’t cater at all to the cruise crowd at all— Their departure for the outer reef begins before the cruisers can get to shore. Score one for them! Next Post Travel Journal: The Adventure Begins. Goodbye Sydney.